♦ Verðlaun: Bresku UKLA-barnabókaverðlaunin 2014 voru veitt 4. júlí síðastliðinn. Sagan af bláa hnettinum eftir Andra Snæ Magnason, í þýðingu Julian Meldon D’Arcy hlaut þessi virtu verðlaun í flokki bóka fyrir lesendur á aldrinum 7-11 ára. Bókin var í vor tilnefnd á fimm bóka úrtökulista, en verðlaunin eru veitt í þremur flokkum af The United Kingdom Literacy Association. Sagan af bláa hnettinum er fyrsta þýdda bókin sem hlýtur verðlaunin. Í umsögn dómnefndar segir m.a. : „Sagan af bláa hnettinum er frumlegt ævintýri sem mun höfða til aðdáenda Maurice Sendak, Dr. Seuss og Hans Christian Andersen.“ Í frétt á vef Forlagsins má lesa fleiri umsagnir. Verðlaunin voru veitt á fimmtugasta þingi UKLA-samtakanna, í Háskólanum í Sussex í Brighton. Þangað mættum við Andri Snær ásamt þýðandanum Julian Meldon D’Arcy og fleiri tilnefndum texta- og myndhöfundum. 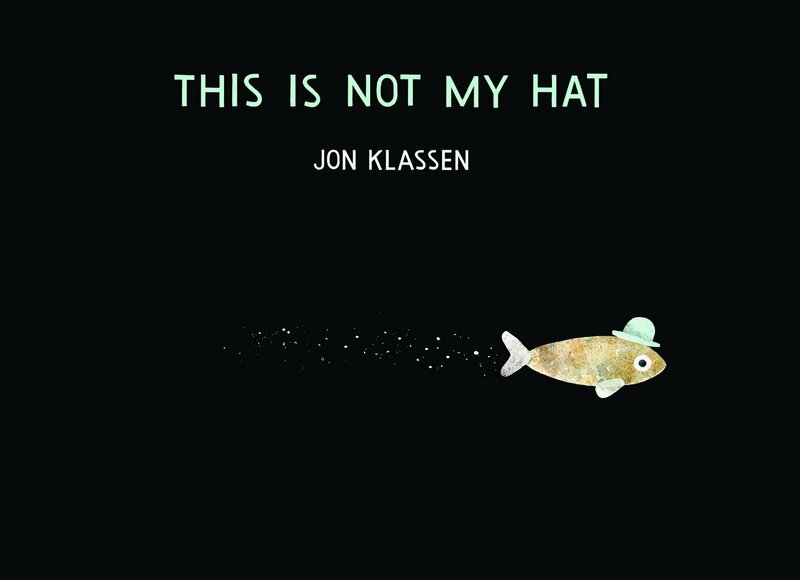 Verðlaun í flokki bóka fyrir yngstu lesendurna hlaut kanadíski teiknarinn og rithöfundurinn Jon Klassen, fyrir margverðlaunaða bók sína This is not my hat. Verðlaun í flokki bóka fyrir lesendur á aldrinum 12-16+ hlaut Michael Williams, rithöfundur og óperustjóri Cape Town Opera, með meiru, fyrir bókina Now is the Time for Running. ♦ Book award:The Story of the Blue Planet by Andri Snær Magnason, translated by Julian Meldon D’Arcy, received UKLA Book Award 2014 at a reception in The University of Sussex in Brighton on the 4th of July. Earlier this year The Story of the Blue Planet was shortlisted for the age 7-11, the first book in translation to be nominated and to win the award. Alayne Öztürk, President of UKLA said “UKLA is committed to the importance of a diverse range of literature for children and young people. We know that literature broadens the reader’s experience of the world and sense of the possible and thus should have a central place in classrooms and educational contexts. The exceptional quality of the shortlists this year and the truly outstanding winners shows that there are many gems to be found amongst the smaller presses and we are proud to be celebrating international authors and illustrators at our 50th International Conference”. Read more about the all on Andri Snær Magnason’s homepage! I put the list of the shortlisted books below – I for one am looking forward to read a stack of them! The Story of the Blue Planet by Andri Snӕr Magnason, illustrated by Áslaug Jónsdóttir; translation by Julian Meldon D’Arcy. The Terrible Thing That Happened to Barnaby Brocket by John Boyne, illustrated by Oliver Jeffers. The Naming of Tishkin Silk by Glenda Millard, illustrated by Caroline Magerl. Liar and Spy by Rebecca Stead. Sagan af bláa hnettinum | On the UKLA Book Awards 2014 shortlist! ♦ Tilnefning. Enn berast góð tíðindi frá Bretlandi því nú hefur Sagan af bláa hnettinum eftir Andra Snæ Magnason verið tilnefnd á fimm bóka úrtökulista til UKLA barnabókaverðlaunanna 2014. Þau eru veitt í þremur flokkum af The United Kingdom Literacy Association. Bókin var valin á lista úrvalsbóka fyrir lesendur á aldrinum 7-11 ára. Verðlaunahafar verða tilkynntir í júlí 2014. Breski útgefandinn er Pushkin Press í London, en þýðandi er Julian Meldon D’Arcy. Sagan af bláa hnettinum er eina þýdda bókin á listunum þremur. ♦ Shortlisted! 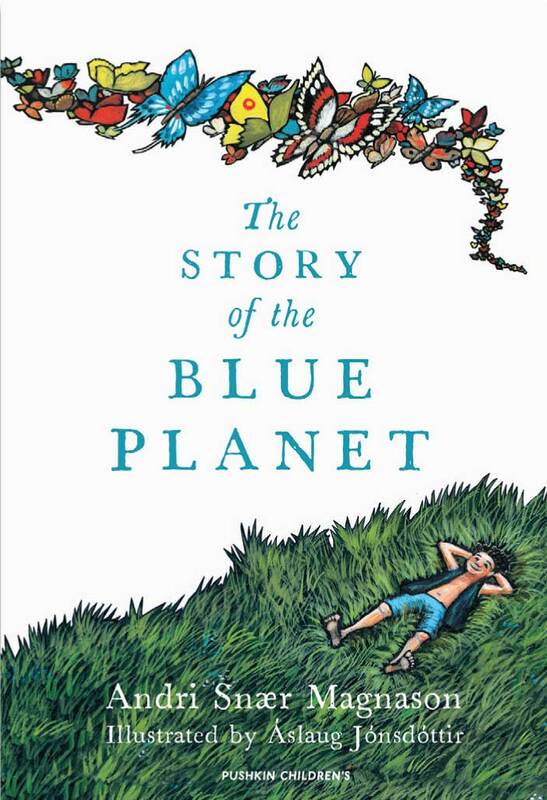 The Story of the Blue Planet by Andri Snær Magnason is shortlisted for the UKLA Book Award 2014 – for age 7-11. Winners will be announced in July 2014. Sagan af bláa hnettinum – The Story of the Blue Planet is published in the UK by Pushkin Press, London, translated by Julian Meldon D’Arcy. Read more about the award and the selected books on UKLA’s homepage. Looking for more information? See Forlagið publishing Children’s book catalog. ♦ Tilnefning. Góðar fréttir frá Bretlandi! Sagan af bláa hnettinum eftir Andra Snæ Magnason er tilnefnd til UKLA barnabókaverðlaunanna 2014 sem veitt eru í þremur flokkum af The United Kingdom Literacy Association. Bókin er valin á lista úrvalsbóka fyrir lesendur á aldrinum 7-11 ára. Úrtökulistinn telur 24 bækur, en styttri listi verður birtur í mars 2014 og verðlaunahafar tilkynntir í júlí 2014. Önnur bók eftir íslenskan höfund, Oliver eftir Birgittu Sif, er á listanum fyrir börn 3-6 ára. Þetta hlýtur að teljast harla góð frammistaða íslenskra höfunda! The Story of the Blue Planet er gefin út af Pushkin Press í London og er eina þýdda bókin á listunum þremur. ♦ Longlisted! The Story of the Blue Planet by Andri Snær Magnason is longlisted for the UKLA Book Award 2014! Shortlisted titles will be announced in March 2014, the winner in July 2014. 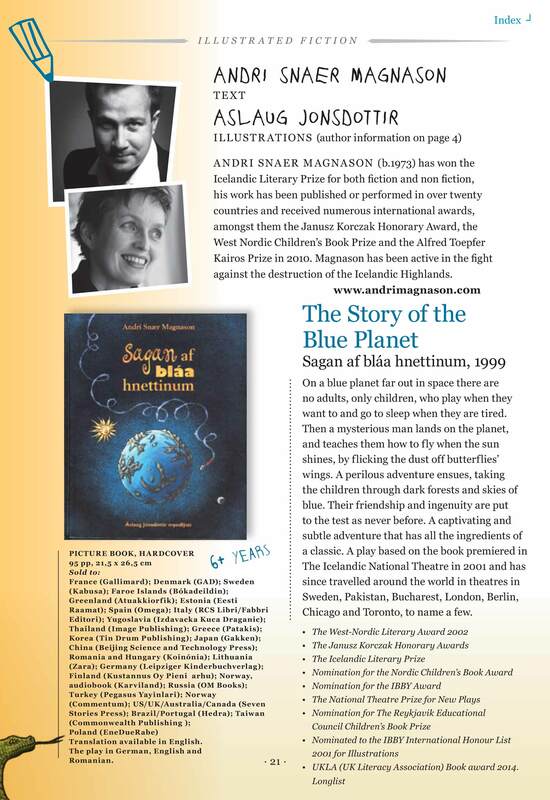 Sagan af bláa hnettinum – The Story of the Blue Planet is selected on a list of books for children age 7-11. It is the only translated book on the three longlists of altogether 70 books. It’s published in the UK by Pushkin Press, London. 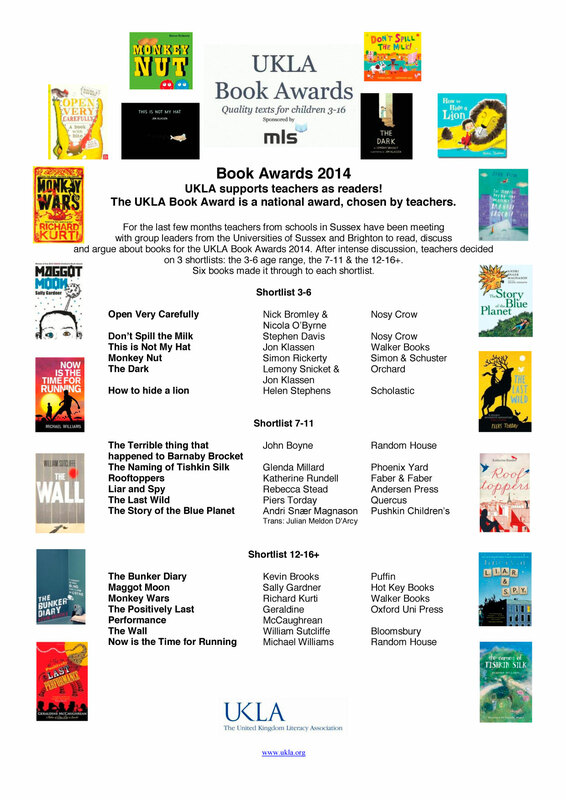 Read more about the award and the selected books on UKLA homepage.